Most organizations strive to behave responsibly, and examples of egregious, intentional non-compliance are rare. But many executives worry something could slip through the cracks, inadvertently breaking a law or causing injury. That anxiety brings visions of PR disasters, dangerous products, penalties, fines and declining revenue. 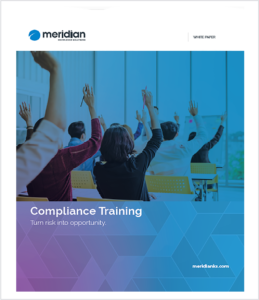 To keep those visions from turning into prophecies, today’s executives are raising the priority of compliance learning initiatives and increasing compliance budgets and resources, especially in heavily regulated industries. Download our Whitepaper - Turning Risk into Opportunity, to keep the visions from turning into prophecies.